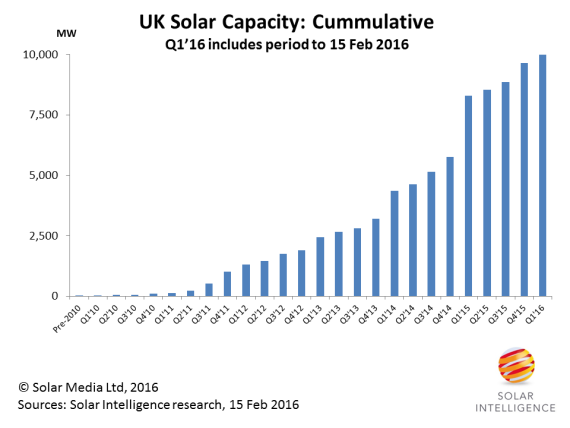 According to Solar Power Portal, the UK solar industry has reached a cumulative capacity of more than 10 GW. Solar Power Portal, part of the Solar Media organisation, exclusively revealed that the UK solar PV industry had “broken through the 10 GW barrier.” The news comes just weeks after the European solar industry trade body, SolarPower Europe, revealed that the UK would remain the region’s largest solar market in 2016. 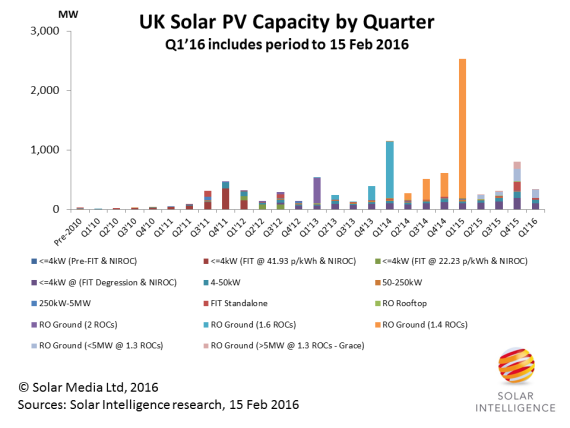 According to Finlay Colville, head of intelligence at Solar Media, the strong 2015 was immediately followed by six weeks of continued growth in the UK, which saw 340 MW of solar added to the country’s cumulative capacity at the end of 2015 of 9.66 GW. The biggest contributions to the 10 GW mark were made in the first quarter of 2015, which saw 65% of the total 3.9 GW installed in the UK in 2015, according to Colville. As can be seen below, Q1’15 represented a significant shift in the growth trend from previous quarters. The UK Solar Trade Association has also jumped on the solar-hype bandwagon, claiming that UK residential solar remains a good investment.